The historic Dandridge Courthouse has seen much of America’s history and is also home to a large local museum and historical archives. 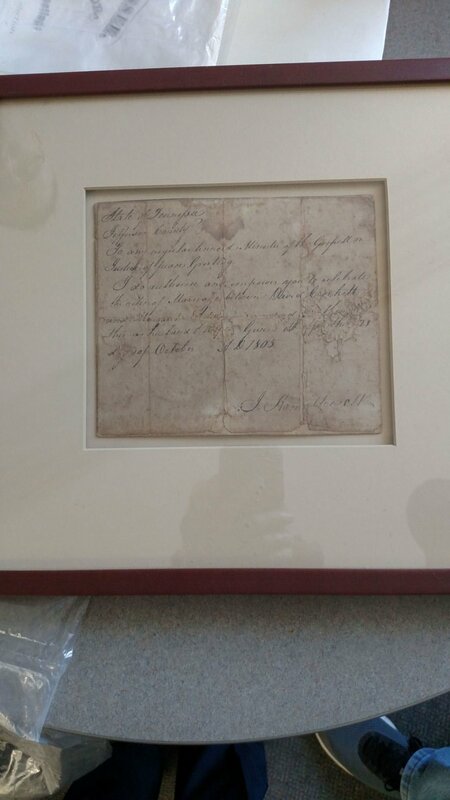 One of Jefferson County’s prized artifacts is a marriage bond for David Crockett. It’s hard to believe there’s been a Jefferson County longer than there’s been a State of Tennessee, which received its statehood back in 1796. Jefferson County has been around before then, back when the whole region was known as the Southwest Territory. In fact the county had once been a part of Caswell County back in the State of Franklin days. Dandridge, Jefferson’s county seat, is the ideal place to spend a spring or summer day. The old town has kept much of its earlier buildings and a drive through the town is candy for the eyes. Among the top of places to see and visit is Dandridge’s 1845 Greek Revival courthouse, located on Main Street, and is one of the oldest active courthouses in the state. According to Bob Jarnagin, the county’s master historian, the present courthouse even at its age is the county’s third courthouse. With the founding of the county in 1792, the first courts met at Jeremiah Matthews’ cabin. Not long afterwards, the county used handmade bricks to build a single-story courthouse on the site of the present courthouse. When that courthouse was razed for the present building, those valuable bricks were salvaged for a local business. The present courthouse, which is on record as having been a Civil War hospital, is built of handmade bricks laid in a running bond pattern and has two main floors topped by a three-level cupola. The early plan for the courthouse called for four offices and a courtroom on the first floor and four offices and a large auditorium on the second floor. That auditorium has seen Christmas balls, theatricals, concerts and school graduations. Examples of high level craftsmanship from nearly two centuries back can be seen which show the work of experienced carpenters using mostly hand tools. A good example is the solid roof rafters put together with pegged connections and no nails. In the 1950s a two-story brick addition was added to the west side of the building. A new building adjacent to the courthouse houses the register of deeds and the county court clerk’s offices. On a recent trip to Dandridge, my buddies Eddie Woods and Ronnie Yount spent some time in both offices visiting with Ed Stiner and Frank Herndon. Both offices had a congenial and unhurried but professional atmosphere. With the coming of Douglas Lake in the early 1940s, the courthouse, along with much of the original town of Dandridge, was threatened with being covered by the lake. The town was saved when President Roosevelt signed an executive order that a dike be built to protect the town. That dike, which sets above much of the older town, is a prominent feature of Dandridge. A major attraction for many visitors to the courthouse is the massive collection museum-quality artifacts, mostly contained in cases throughout the building. At the museum’s beginning in 1958, folks began bringing in unique and personal treasures from across the ages to be displayed. Many of those artifacts held personal memories of the original owners, and serve to pass down a personal touch from the past to younger generations. Those artifacts now number into many thousands and require a considerable period of time to completely look over. Among the most historical of the county’s holdings is an 1806 marriage bond between David Crockett and his intended bride which, along with other valuable documents of national importance, are kept secured. Crockett’s actual rifle he carried in Jefferson County is a featured exhibit at Knoxville’s Museum of East Tennessee, while the Dandridge museum has obtained a close reproduction of the Crocket rifle carefully crafted by Clive Valentine. A recent addition to the museum’s collection has been provided by Iwo Jima Marine vet, former Carson-Newman instructor, author and accountant Joe Mack High. High had been friends with C-N teacher Janie Huggins, who passed on to High several of her dad’s possessions. Her dad, Dr. James I. Huggins, had been an early importer of Angus cattle and was also a White Pine doctor who tended those hurt in the New Market Train Wreck. His saddlebags and photos of his early Angus bulls are now on display. A Jefferson County blessing is that the courthouse has never burned, which has saved intact documents dating back to the county’s birth, and which also include some records from Hamblen, Cocke and Sevier Counties. Until 1996, when the Jefferson County Archives was established, those valuable old records were stored in stacks inside hundreds of fruit boxes. With the County Commission providing a room and a budget, a remarkable corps of serious professional volunteers under the early leadership of Lu Hinchey began cataloging and microfilming those documents to save them from wear and tear. To date, those volunteers have spent thousands of hours digitizing the documents for the hundreds of visitors, some from far off countries, who come through searching for early information. A beginning effort was to index and scan into a computer county marriage records from 1792 until the present. As time passed, land deeds and land grant records, earlier maps, last will and testaments, probate records and other documents were added to the catalog, making the archives a researcher’s paradise. At this time, several of those volunteers have received the Certified Archives Manager certificate. The mission of the archive volunteers is to preserve and restore those remaining boxes of documents and to assist visitors in their family heritage and in documents that relate to the history of the county. The archive volunteers also have the responsibility of managing the museum cases and deceased veteran cases in the building. Located on the second floor and now under the leadership of Wayne Roberts, the archives first opened to the public on January 1997, and is currently open weekdays from 9 a.m. – 3:30 p.m. Volunteers are available to meet visitors researching their family histories, as well as assisting county officials. The archives can contacted at Jefferson County Archives, Room 203, Jefferson County Courthouse, P.O. Box 1193, Dandridge, TN 37725; or a call at 865-397-4904; or email archives@jeffersoncountytn.gov.